This one will have you daydreaming about the ocean with every glance. 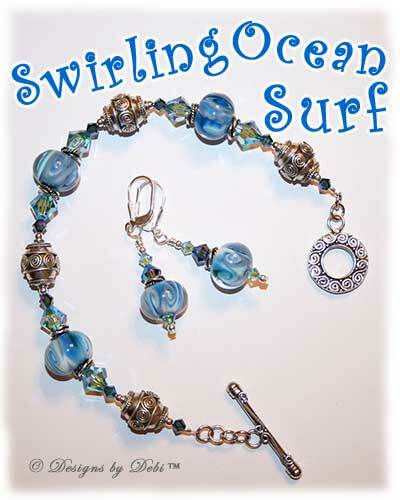 I named it Swirling Ocean Surf because that's exactly what these beautiful lampwork glass beads remind me of. In an attempt to create the effect of ocean waves twinkling in brilliant sun, I used Swarovski Crystal bicone beads in Aquamarine AB2x and Montana AB2x and it worked beautifully. The photo doesn't begin to capture the effect. I continued the swirling theme with these gorgeous Bali silver beads, twisted rings and elegantly scrolled and detailed toggle clasp. The sterling and Bali silver leverback-style earrings match the bracelet perfectly. The donation from this month's piece is again going to the American Red Cross to help those still suffering the effects of Hurricane Katrina and those affected by the horrible outbreak of tornadoes and floods this year. Hope you're enjoying your summer! Have a wonderful weekend! 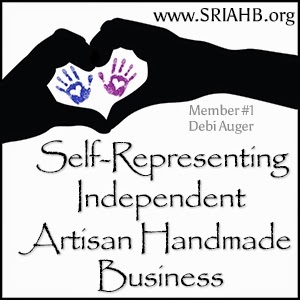 Designs by Debi is having a Christmas in July Sale!! For the whole month of July, enter the code CHRISTMASINJULY2011 to receive 20% off your order. Jewelry for Charity Pieces and Gift Certificates are not included in this offer. However, custom designs are AND you can use the code as often as you want until July 31st. Even though Christmas and snow is probably the last thing you want to think about in July after waiting so long for summer, it's actually the perfect time to think about your holiday shopping... especially if you combine this sale with my layaway program!